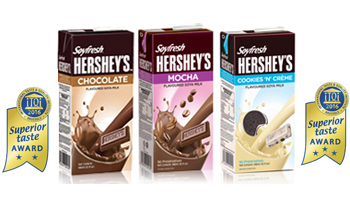 HERSHEY’S Soyfresh Chocolate Soya Milk offers The Great HERSHEY’S Chocolate taste in a convenient, ready-to-drink UHT packs for consumers who loved a chocolate drink. Made from the finest HERSHEY’S chocolate ingredients in a specially formulated proprietary recipe of a smooth soya milk drink, each taste of HERSHEY’S Soyfresh Chocolate is a moment of enjoyment and pleasure. HERSHEY’S Soyfresh - The Taste of Happiness. Having extensive expertise in the formulation of RTD soya milk, Ace Canning is the official licensee for HERSHEY’S Soyfresh Soya Milk, in Malaysia, Singapore, Thailand, New Zealand, Australia, Brunei, Indonesia, Philippines and Vietnam. The trademark and trade dress are used under license.